Times: 10:00 am, M-F; 11:00 am, Sat. 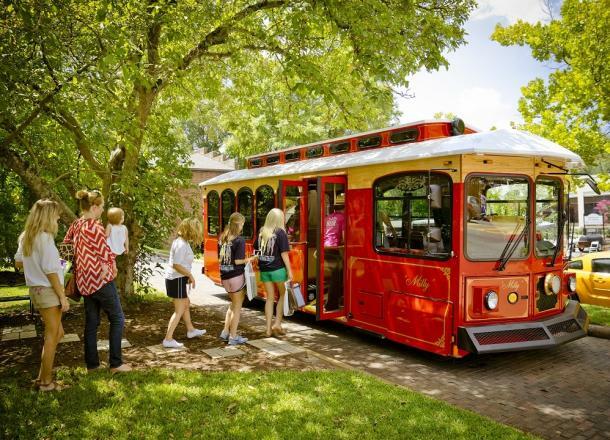 The Milledgeville guided trolley tour includes rotating visits to the Old State Capitol, c. 1807, St. Stephens Episcopal Church, c. 1841, Lockerly Hall, c. 1839, and the Brown-Stetson-Sanford House, c. 1825. The trolley is available once daily, Monday - Friday at 10:00 am and Saturday at 11:00 a.m. During the month of January the trolley will only be available Thursday, Friday & Saturday. The tour normally stops at Rose Hill on Monday – Wednesday and at the Brown-Stetson-Sanford House on Thursday - Saturday. Tour stops vary daily. All tours begin at the Convention & Visitors Bureau. The cost is $15 for adults, $12 for seniors, $10 for students and $7 for children 6-13. Children 5 and under are free. Please note that while our trolley is ADA compliant, not all of our historic attraction partner stops are currently ADA accessible.